ADDRESS: 1837 Gina Lane, Tallahassee, FL 32303. Hidden Lakes subdivision off Tharpe Street between San Luis and Mission Roads. Off Mary Ellen Drive beside the Racquet Club Neighborhood. Northwest. Near Bus Route E.
APPLICATION: Written Application for verification of Rental History, Employment & Income, Credit Report, etc. $50.00 Application Fee per Person or Married Couple. This is Non-Refundable. LIVING AREA SIZE & ROOMS: Living & Dining Rooms are Combined. Kitchen has Bar & looks into Living/Dining Rooms. Brick Fireplace on side wall; Vaulted Ceiling in Living Room. There is an Inside Laundry. About 1000 Sq. Ft.
SECURITY DEPOSIT: $925.00. This is not the last month's rent. TERM: Lease to end June 30 with option to renew for next one year term. PETS: Pets under 30 lbs may be considered. There is a Pet Application and Interview with the Pet. Pet Fee varies with the Pet ($250.00 per Pet). This is Non-refundable. With pets, the tenant must have a Tenant’s or Renter's insurance policy addressing Pet Liability. PARKING: Two Parking spots. No Garage or Carport. 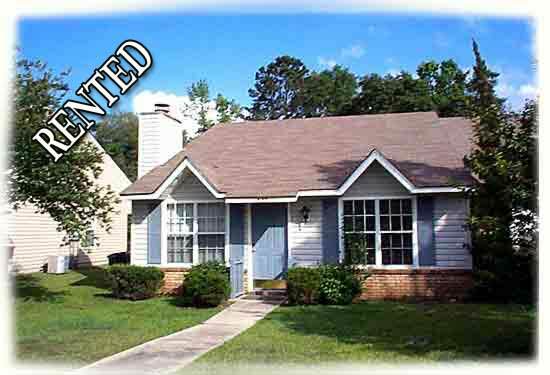 AMENITIES: Tile Floors in Living/Dining Rooms, Kitchen, Laundry & Two Bathrooms. New Carpet in Two Bedrooms. Three Ceiling Fans. Covered Back Porch, Outside Storage Room, Deep Yard. In Excellent Condition!